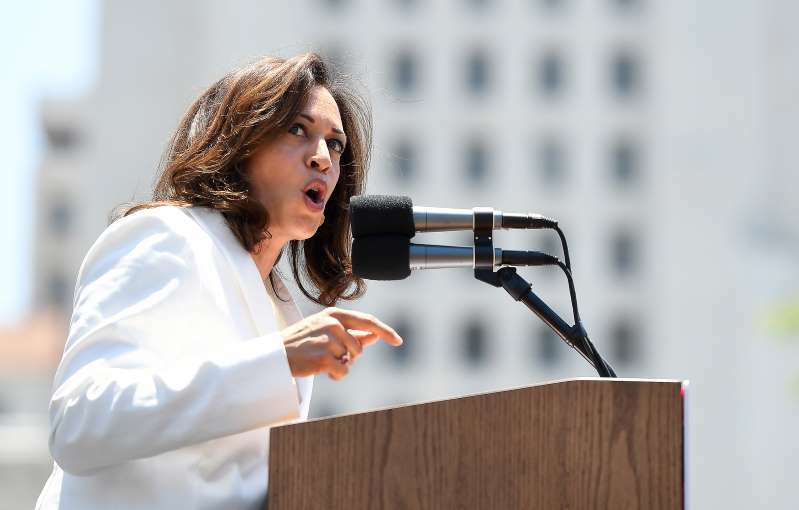 © Wally Skalij/Los Angeles Times/TNS Sen. Kamala Harris (D-Calif.) speaks during a rally in downtown Los Angeles on June 30, 2018. Sen. Dianne Feinstein on Sunday accused President Donald Trump of holding himself "above the law," and warned that Judge Brett Kavanaugh, Trump's Supreme Court nominee, viewed the president as an "oligarch" who cannot be investigated or tried for crimes. Speaking at a swanky Santa Barbara hotel to a group of mainly women attending the Year of the Woman luncheon, Feinstein, D-Calif., emphasized that Kavanaugh's confirmation hinged on the votes of Republican Sens. Susan Collins of Maine and Lisa Murkowski of Alaska. "Both women," she added. "The president believes he is above the law. And this nominee believes this president cannot be investigated, cannot be tried," Feinstein said. It was Feinstein's latest campaign stop as she attempts to mobilize supporters for her re-election in November. Feinstein is 20 percentage points ahead of her opponent, state Sen. Kevin de Leon, D-Los Angeles, and her campaigning was noticeably light during the August recess. Her comments came on the heels of a four-day confirmation hearing in which Feinstein and Sen. Kamala Harris, D-Calif., grilled Kavanaugh on issues such as abortion and gun rights. Seven seconds into the proceedings, Harris launched an attempt to shut down the hearing over stymied access to documents, an aggressive tack that contrasted with Feinstein's more civil-style of questioning. Some progressives criticized Feinstein, saying the Trump era requires a more confrontational approach. Attendees of the event, held by the Democratic Women of Santa Barbara County, apparently felt differently. The audience applauded when Rep. Salud Carbajal, a Santa Barbara Democrat, who interviewed Feinstein during the luncheon, praised her as having done an "extraordinary job" grilling Kavanaugh. Feinstein's comments added to increasing pressure on Collins and Murkowski - who have a reputation of at times breaking with lock-step Republicans - to oppose Kavanaugh's nomination. In one striking form of protest highlighting Kavanaugh's suspected opposition to Roe vs. Wade, activists from across the country have mailed at least 3,000 coat hangers to Collins' office, a reminder of the crude and dangerous method women used to end pregnancies before abortion was legal, The Associated Press reported. Feinstein also lamented "hyper-partisanship" and the president's "erraticism" and "lying." And she said special counsel Robert S. Mueller III's investigation into whether the president's campaign conspired with Russia during the election - and whether the president himself obstructed justice - was the most important government investigation of her political career. Robin Silverander, a Santa Barbara therapist who works with children being bullied in elementary school and attended the event, said after the lunch that she wished she could have asked Feinstein what the senator has done to try to persuade her Republican colleagues in Congress to stand up to the president. She said she fears the children she counsels will look up to Trump as an example of using bullying to succeed. The senator left without taking questions from the audience. "What do they say behind closed doors?" Silverander said.